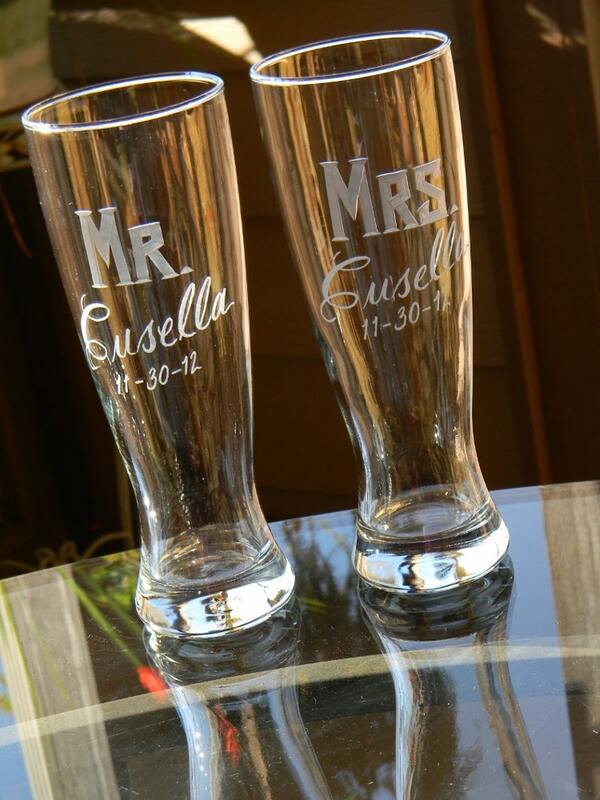 These MR & MRS pilsner glasses are a cool gift for the newly wed couple and can be used for the first wedding toast! This attractive pilsner features a heavy base and comfortable curved shape body that feels good in your hand. It holds a whopping 23oz of beer while displaying a nice head of foam. These glasses make a great engagement, shower, wedding or anniversary gift! ►Any set in my listings can be altered. If you only want one glass...let me know, if you would like ten let me know. I can create a custom listing to suit your needs. Please convo message me and we can customize a listing just for you! +these glasses were so beautiful! they were the perfect choice for us for our wedding toasting glasses. thank you jennifer for making such an amazing product. would order again! -Jen is fantastic! Not only was I amazed at the beauty and craftsmanship of the glassware she created for me, but they arrived without any damage and VERY quickly! Incredible ETSY store! +These are so beautiful! They are going to make my wedding extra special, thank you! I can't wait to drink champagne out of my beautiful toasting glass! My fiance was even impressed (and that doesn't happen often). These glasses will make such a special keepsake for the rest of our life together. Thank you so much Jennifer, you are a truely talented artist! Such great quality! I ordered these for my SIL and her fiancé for their stock the bar shower and they were amazing!!! A perfect gift for my friend and her new husband! Beautifully etched, perfectly done! Shipped earlier than I expected and was packed carefully to ensure no breakage. I will definitely order from Jen again! These turned out beautiful...I love them!!!! Can't wait to use them at my wedding. Rustic Beer Mugs Personalized with Hand Engraved Carved Tree Heart and Initials. Gift for couple. Gift for Man. Gift for Wedding.